Where can foundations, companies, and even governments get the most social impact “bang for their buck” in K-12 education? A new report attempts to answer that question, singling out the top 10 areas recommended for investment, along with the costs and risks associated with each of 25 opportunities within those general categories. Within these general areas, 25 specific activities were identified and evaluated, based on their risk, potential impact, and sustainability. 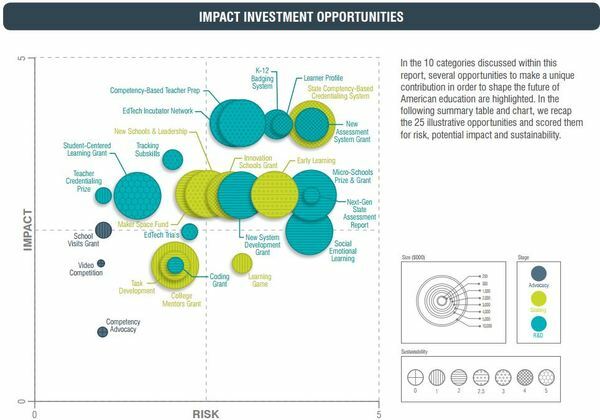 (The quadrant chart above shows how those opportunities are weighted on a risk-impact scale.) Of the 25 opportunities identified,12 would require commitments of $10 million or more, while two—providing advocacy support about competency-based education for three years, and a video competition about next-generation learning—were requests with funding needs of $300,000 or less. Establishing a “maker space fund,” for $10 million, which would provide matching grants to support maker spaces in 10 cities; the spaces initially would be developed outside of school to showcase active and student-led learning. To arrive at the findings, the Getting Smart team conducted interviews with various stakeholders in education, and held a design workshop to define and expand upon the opportunities. The ideas presented are “not exclusively philanthropic,” David J. Ferrero, senior program officer for education with Vulcan’s philanthropy team, wrote in a blog post about the study. “Some are or could be approached as venture or return-seeking investments. They all see large-scale sustainable impact,” he wrote. The report’s authors also indicate that it is not an “exhaustive” list of all opportunities available. “We hope this report will start conversations and further research on the impact opportunities that different organizations could participate in in order to advance high-quality K-12 education,” said Ferrero. Chart: From “25 Impact Opportunities in U.S. K-12 Education” by Getting Smart, in partnership with Vulcan Inc.